The following 10 Zen stories are a selection of the ones which are very popular and people find them most inspiring and really worth to read and shared about. Some may be instantly understood, some others need to be thought through and recognized in oneself. Then the younger monk asks again, "but then Sir, how is that you lifted that woman on the roadside ?" The elder monk smiled at him and told him " I left her on the other side of the road, but you are still carrying her." One day Mara, the Evil One, was travelling through the villages of India with his attendants. he saw a man doing walking meditation whose face was lit up on wonder. The man had just discovered something on the ground in front of him. Mara’s attendant asked what that was and Mara replied, "A piece of truth." 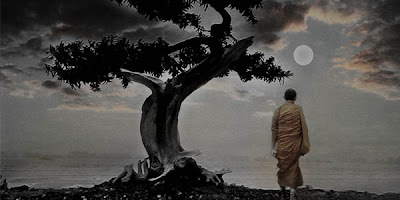 One day a young Buddhist on his journey home came to the banks of a wide river. Staring hopelessly at the great obstacle in front of him, he pondered for hours on just how to cross such a wide barrier. Just as he was about to give up his pursuit to continue his journey he saw a great teacher on the other side of the river. The young Buddhist yells over to the teacher, "Oh wise one, can you tell me how to get to the other side of this river"? The Buddha asked his disciples to get a large magnificent elephant and four blind men. He then brought the four blind to the elephant and told them to find out what the elephant would "look" like. The first blind men touched the elephant leg and reported that it "looked" like a pillar. The second blind man touched the elephant tummy and said that an elephant was a wall. The third blind man touched the elephant ear and said that it was a piece of cloth. The fourth blind man hold on to the tail and described the elephant as a piece of rope. And all of them ran into a hot argument about the "appearance" of an elephant. The Buddha asked the citizens: "Each blind man had touched the elephant but each of them gives a different description of the animal. Which answer is right?" When Bankei had read the petition he called everyone before him. "You are wise brothers," he told them. "You know what is right and what is not right. You may go somewhere else to study if you wish, but this poor brother does not even know right from wrong. Who will teach him if I do not? I am going to keep him here even if all the rest of you leave."